Our guide will pick you up from Alexandria port then transfer privately in comfort modern van to experience the wonders of the ancient world riding 4 wheels bike. Admire the stunning view of Giza famous Pyramids of Cheops, Chephren & Mykerinus. Then visit the Sphinx of pharaoh head with body of lion, proceed to the Valley Temple belongs to the Pyramids complex of king Chephren. Move to Saqqarra, you will first relish short 4x4 adventure deep into the desert then stop to wander the panoramic view of King Zoser Pyramid or Saqqara Step Pyramid, believed to be the first stone structure built by humans. Continue with camel back ride to reach Sakkara Country club where you will savor the buffet lunch meal then transfer back to Alexandria Port. Book Alexandria Wheelchair Tour to Cairo. 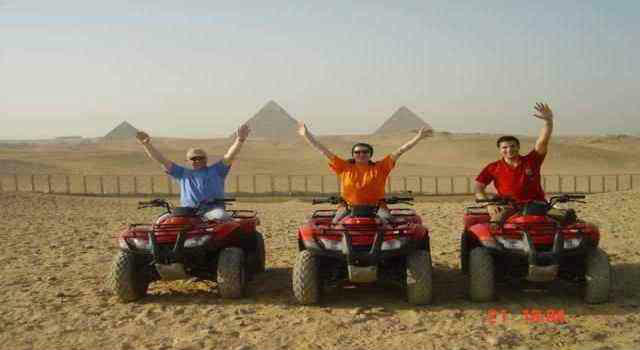 Accessible Trips to Giza pyramids, Sphinx, Egyptian Museum & Cairo Disabled Excursion From Alexandria Port starts and ends at the exit door of your cruise ship.